Over the past few weeks in our blog we have been looking through the Stick & Cane Shop providing a thematic look at some fabulous gift ideas for our loved ones. It is getting very close to Christmas with under two weeks remaining of shopping time before the big day, so it's definitely the time to buy if you want to ensure your gifts are available in time. This week we thought we would continue looking at some spectactular gift ideas from across our shop featuring some old favourites and one brand new cane that we just got in stock this past week. Ordering with us is easy, and can be done online or by phone. We accept all major cards and paypal, and for a little extra charge we can offer a guaranteed next-day delivery service if the order is placed by 1 o'clock. You'll also receive detailed tracking including a very useful one-hour delivery window on the day of delivery, so you don't have to wait in all day on your parcel arriving. So if you are looking for that special something for a loved one this Christmas, why not purchase one of these fabulous canes from the Stick & Cane Shop today. 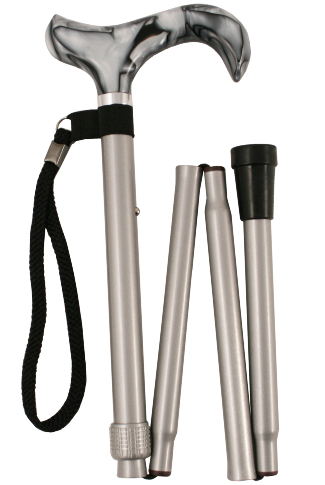 If you are looking for a sophisticated stick, but one that is also portable, then be sure to try the Grey Marbled Acrylic Derby Handle Folding Walking Stick. This works well as both stick for day-to-day use and a dress cane for special occasions. This folding stick is fully adjustable and features a Grey marbled acrylic derby handle with black wrist strap and silvery grey shaft. Lightweight and easy to use, this cane is a firm favourite with our customer and it can be snapped open in seconds into a strong support stick. It folds up easily and can be stored in the plastic wallet provided when not in use. New to the Stick & Cane Shop over the past week is the wonderfully sparkly yet stylish Silver Lamé Derby Dress Cane. This is a beautiful cane suitable for evening use. The derby handle is made from smooth acrylic, laminated to enclose a layer of glittering silver lamé material on each side of the handle. The centre of the handle is black acrylic, forming a smart black stripe along the top of the handle. It is mounted on a black hardwood shaft, fitted with a smart chrome collar and a non-slip black rubber ferrule. A wonderful gift idea for a loved one this Christmas season!